Family traditions are kind of weird. Like, how do they just happen? Who determines it a “tradition” rather than some kind of thing that just happened? Either way, my family has quite a bit of weird traditions or things that totally mean “holidays” to us. Lots of people open presents on Christmas Eve. To that, I wanna say WTF. I’m not lying: if I could demolish all the presents wrapped for me under my tree rightthissecond I totally would want to… but my impulses would be outweighed by my wanting to wait until Christmas day. I mean, that’s the point right? The whole countdown til the 25th kinda thing. Not spoil it by ripping everything open the day before. So to pacify our impulses, my grandma allows us to open one SMALL present at her house every year. Oh yeah, did I mention we do all of our holiday functions with her? Like clockwork, every year, we’re at her house Christmas Eve night for pizza, at back at her house Christmas day at 9am for brunch. As I was saying: Christmas Eve. We eat pizza from this AWFUL place near her house. I’m not sure what drives her to purchase this pizza, as it tastes very closely to drywall and death, but for whatever reason, we eat our pepperoni-flavored dry wall and then watch the cartoon version of How the Grinch Stole Christmas. No way would I let the family partake in a viewing of the new Jim Carrey version, as I have a gross dislike for Jim Carrey. I don’t know. He’s creepy. Moving on. You all should know by now I’m crazy. It didn’t just happen like that. I was born into a crazy family of individuals who love Christmas. Like, we’re psycho for it. And remember my aforementioned note about wanting to wait until Christmas morning to rip open our presents? It should be taken VERY literally. Because for my WHOLE LIFE I was the brat who woke up at ungodly hours and woke my parents so we could open gifts. As a young kid, my parents said I couldn’t wake up earlier than 6… but they were always lenient on that rule, and more or less we’d be up between 5 and 6 am. But over the years that time has creeped up higher and higher, even after my siblings and I get older and older. Can you guess what time we woke up to open presents last year? No Barbies. No Hot Wheels. No video game consoles, phones, or anything fancy. Just clothes… and maybe gift cards… and for me, the occasional rubber spatula. Def. nothing that warrants a 2:30 am wake-up call. Yet it continues to happen every year. Any guesses on what time we’ll wake up this year? I guess you could say our horrendous wake time is tradition. Or that we’re crazy. It works. When I was doing my cookie baskets, I really wanted to incorporate something SUPER easy–mostly because I was already making 5 other cookies and confections, but also because it would look pretty and be festive, too. 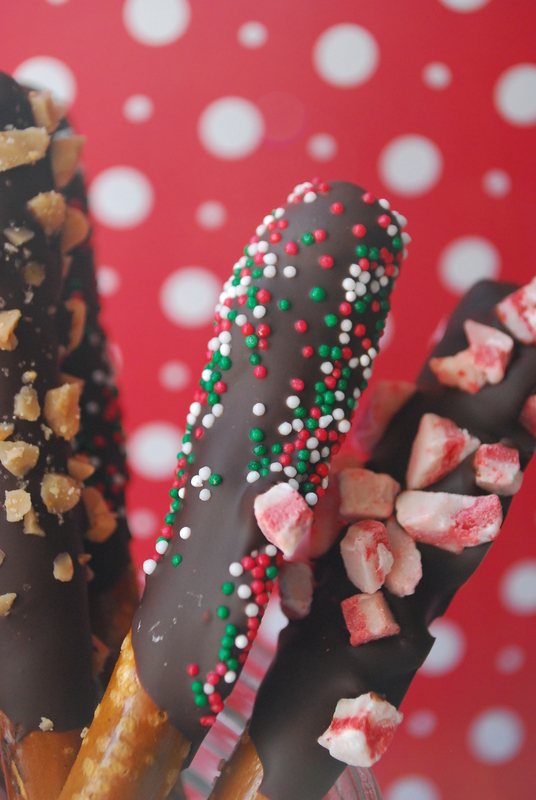 So I thought of pretzel sticks dipped in chocolate and sprinkled with fun, yummy things like non-pareils or peppermint chunks or toffee bits… and I’d call them pretzel “drumsticks” because of the whole Christmas thing and all. There’s that bacon-peppermint lookalike again. I may not listen to religious Christmas music, but I know about it. I’m reppin’ lil drummer boy right here, folks. These are such a cinch to put together and make for great presentation and gifts. Wanna know how? 1. Line a rimmed baking sheet with wax paper; set aside. 2. Meanwhile, melt chocolate bark according to package directions and stir until completely melted and smooth. 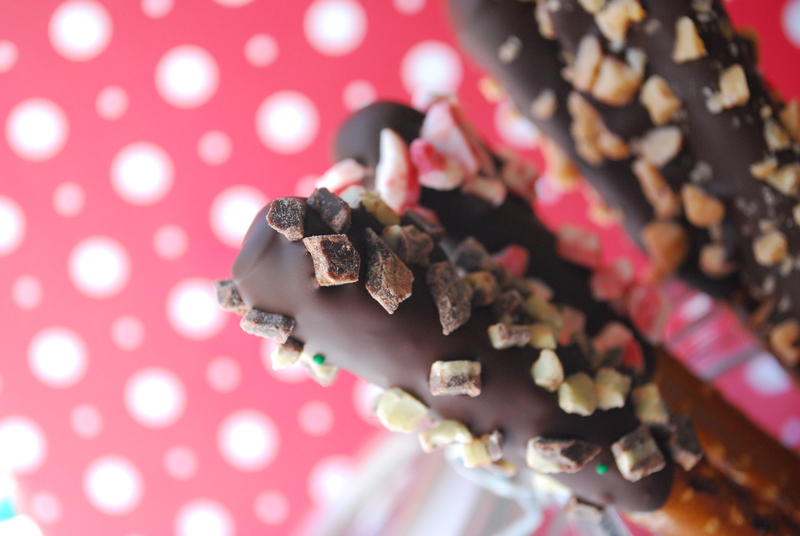 Dip the lower 1/3 of each pretzel rod in melted chocolate and spin the rod to allow the excess chocolate to drip off. Sprinkle the chocolate coating with any desired topping, turning to coat, and place on the wax-lined baking sheet. Repeat process. 3. 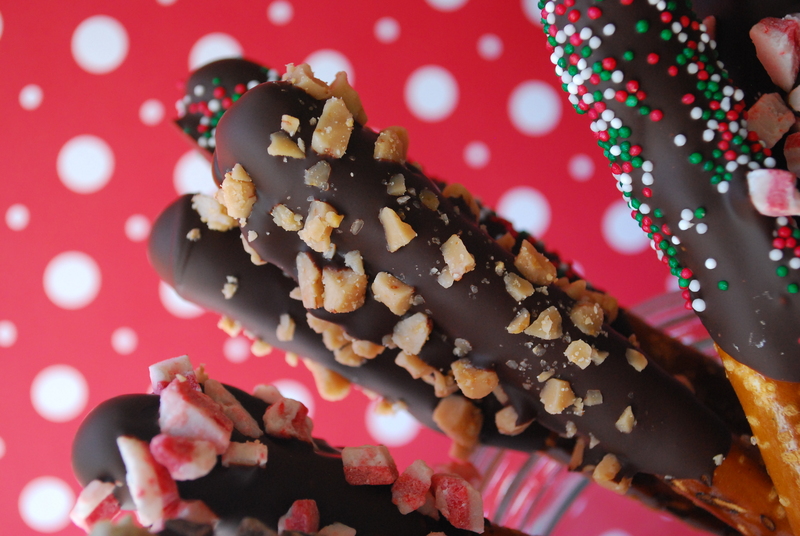 Once pretzels are coated, pop the pretzel rods in the fridge to harden the chocolate. Store airtight. 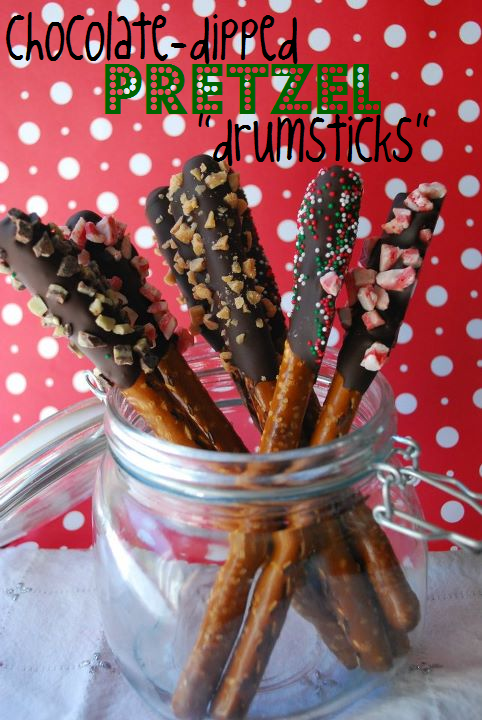 If you wanted, you could always change up the flavors of these pretzel drumsticks by using peanut butter, white chocolate, or colored chocolate or candy bark or adding extracts to the melted chocolate to change it up. Some good ones would be peppermint, eggnog, orange, or even cinnamon. 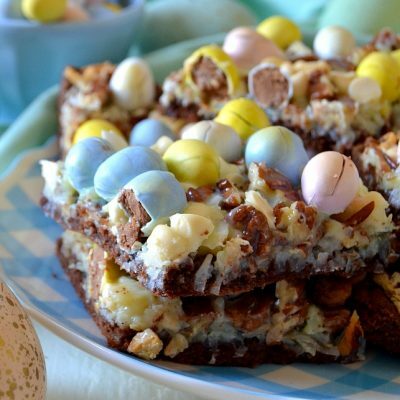 Just use a half teaspoon of extract per one pound of melted chocolate bark. Quick and easy? I’m all for it. Especially if I’ll have more time to open presents at 2 am. Its hard to go wrong with chocolate and pretzels 🙂 I’m with you on opening gifts at 2am! I have to say, I think you and Kristan may just be twins separated at birth! I read over this post quickly in my reader and from the treats you made, the photography you used – the background and the font on your picture and the comical post you wrote I totally thought it was Kristan’s blog!! These look so pretty and would be a welcome addition to anyones cookie basket I would say! plus my sisters and I who are all late 20s/30s also wake up at 2.30am for Christmas Day..still aswell! you just have to! Gem! You rock! Kristan is one of my super-duper favorites 🙂 thanks for the mucho compliment! And I’m glad there are other people who enjoy Christmas and don’t care about clocks on Christmas morning, haha. Kara–I’m glad you and your mom celebrate like little kids still! I think people who are excited to wake up on Christmas morning are more fun than people who “have time” to sleep in–boooring. I’m not sure whereabouts you’re from, but usually the baking aisle in most grocery stores carry melting chocolate. Some name brands are Baker’s, Almond Bark, and Candiquik. Baker’s comes in small boxes in a variety of flavors (white, semi-sweet, bittersweet, German) and the last two usually come in vanilla and milk. I also prefer the last two. However, you could also use Wilton Candy Melts as a substitution (those are found at most grocery stores and all craft stores). They also come in fun colors. ANDD if you can’t find ANY of those, I suggest melting a package of chocolate chips with a Tablespoon or so of shortening over a double boiler or in the microwave, stirring after 30 seconds or so until they’re melted. Melting chocolate chips increases the chance of the choc burning, so if you really can’t find the other ones, this WILL work but you’ll def. need to babysit it. Thanks for stopping by–I hope this helps!! Thank you soo much this helps me tremendously! And sadly I live in an area where they do not get much of anything in any of the stores..I have seen Bakers though so I will try that. Thanks again for answering my question I’ve searched all over the web and all recupes just say “pick your favorite chocolate”. That doesn’t help, keep posting your recipes sound delicious! That’s totally lame that the web says use “any” chocolate because chocolates aren’t created equally! This is injustice–we must protest! 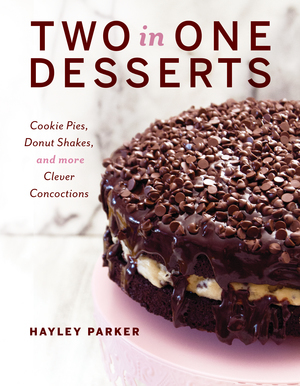 But seriously–Baker’s will be your BFF for any chocolate-melting/dipping you need to do. Next best bet: chocolate chips. Just stay away from candy bars and things of that nature; they alwaaays burn for me and aren’t meant to melt like this. 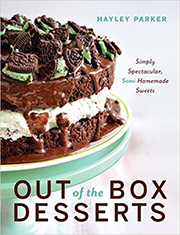 I hope I can see the finished product when your melting-chocolate adventure ends! I agree! Although I did have one website that told me “their own chocolate was the absolute best chocolate to use” that just sounded completely silly to me. But really, I wish other websites were as helpful and friendly as you. Most sites i see people asked questions like 3 years ago, so ofcourse their not going to be going back and checking to see if anyone else had posted that long later…Again, thanks so much you definitely save me from buying some chocolate and hoping that it will turn out. If I had any idea of how to show you pictures of the finished project I surely would, but I have no idea..I feel like my mom right now trying to figure out how to get Internet Explorer up.. I also plan on try a few of your cupcake recipes for Christmas Eve, I literally go crazy making some super complicated cake. This year I’m trying something new, and trying a whole bunch of things..Wish me luck! If you have Facebook, post the pictures on The Domestic Rebel’s Facebook wall! But if not, that’s okay–I am positive your cupcakes and goodies will turn out beautiful and delicious. I’m glad you found my website and I’m always here if you have any questions, comments or just want to chat 🙂 email me anytime, and Happy Holidays, Kara!